The most effective marketing tools are those that your clients will use every day. 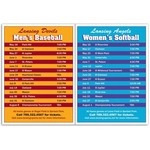 Put your name on something useful with custom promotional calendar magnets from ePromos. These cost-effective corporate gifts make convenient gifts. Show important dates and information about your brand at a glance! Add your name or logo to our stick-on calendars and give customers something they'll see every day. These tiny reminders give them important information they can attach to their fridge, filing cabinet, or gym locker. ePromos’ design team will work with you to capture your brand’s signature style. Give us a call at 877-377-6667 or chat with a representative online to start your order! Getting promotional calendars imprinted with your logo has never been easier. Browse our collection to find an option that's a perfect fit for your business, organization, or event. We offer calendars for the sportsman, old car fanatic or gear head. We also have all kinds of shapes including houses, footballs, hearts and more. Give your clients a promotional product that's remains relevant all year long. Calendars are a great way for you to highlight corporate events or sales throughout the year. For employees, create a company calendar with holidays, enrollment deadlines, or review reminders. For realtors, insurance agents or other salespersons, a magnetic calendar could keep your prospect note out of the junk mail pile. At ePromos, we offer a range of cost-effective options to help you stretch your marketing budget further. No matter what your organization is, promotional calendars make a smart gift. Promotional magnetic calendars are an incredible gift to customers, employees, prospects and more. You know you’ll get tons of brand exposure, since recipients will look at them every day. You can rely on ePromos for expert advice, top selection, best pricing, easy shopping and the job done right – guaranteed. Customize your order with your logo, messaging, or photo today!